William Ernest Figgis was a prominent personality at the School of Mines, Ballarat (SMB). Figgis was awarded the grade of 'excellent' in Practical Plane Geometry (grade 1) in the 1904 June Examination. William Figgis was assistant to Geology lecturer Thomas S. Hart from 1905 to 1907. He also lectured in mineralogy during this time. 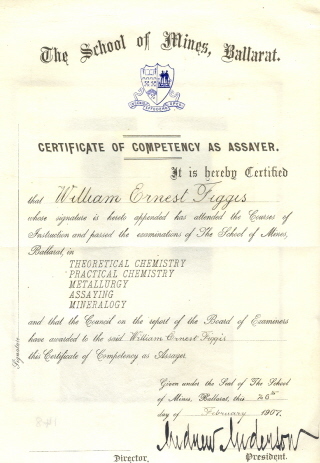 Figgis was awarded his certificate of competency as an assayer on 26 February 1907 passing the subjects of theoretical chemistry, practical chemistry, metallurgy, assaying and mineralogy. 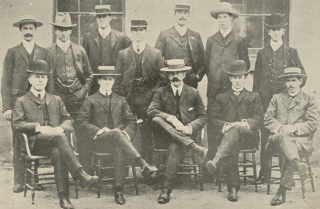 In March 1907 he took up an appointment on the staff of the Broken Hill Junction North Mine. He was sub-editor of the SMB Students' Magazine (sports) in 1904 and was the editor of SMB Students' magazine in 1907. Figgis was elected the assistant secretary of the SMB Sports Association (1905-06) and was a member of the SMB first eight in 1905. In 1906 SMB was fully represented at the Ballarat Rowing Regatta when L. Seward (stroke) and W. Figgis (bow) 'made a bold bid for the Maiden Pair, being beaten by Footscray by a few feet after a hard fight'. William Figgis died on 7 December 1929.